(MissionNewswire) The Salesian-run Higher School of Administration and Economic Policy of Lubumbashi (EcoPo-Lubumbashi) opened in October 2010, and serves as an institution for higher learning in Democratic Republic of Congo (DRC). EcoPo-Lubumbashi is a scientific and professional center providing students a quality education in the field of administration of public and private organizations, offering both masters and PhDs to its students. The center also develops relationships with businesses in order to help students to easily transition from the classroom into the workforce. 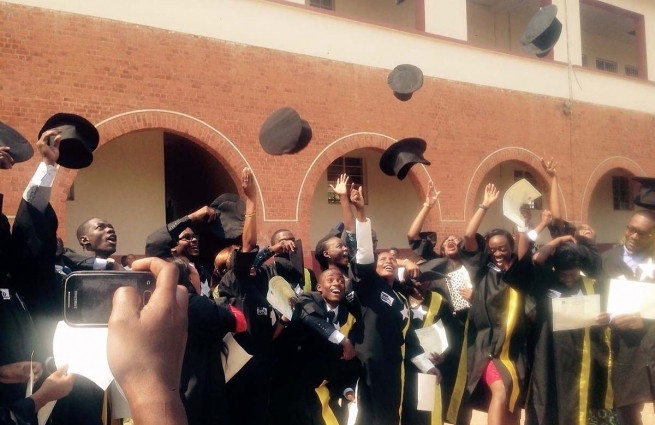 In the 2011-2012 academic year, EcoPo-Lubumbashi was authorized to organize specialized undergraduate and masters programs in the field of management of organizations. In September 2016, the center also received final authorization to issue bonds in accordance with the decree of the Minister of Higher and University Education in DRC. Through the education available to students at EcoPo-Lubumbashi, Salesian missionaries are aiming to form a new ruling class in DRC, able to meet the pressing demands of good administration that arise in different areas of the country. Students are offered a privileged opportunity for study and work. Admission requirements only allow 10 students per teacher so that teachers can accompany and support students individually. In addition, students have access to many opportunities including the center’s library, Wi-Fi access, internships, conferences and seminars. In 2017, with the support of donors and the community, Salesian missionaries plan to build a more modern campus, allowing students to grow in a scientific environment equipped with a new library, a center for distance learning, places of study, recreation areas and entertainment venues. DRC has been plagued by intense civil war and internal conflict since the outbreak of fighting in 1998. As a result, there have been close to 5.4 million deaths, according to the International Rescue Committee. Most deaths resulted from non-violent causes such as malaria, diarrhea, pneumonia and malnutrition, all typically preventable under normal circumstances but often fatal in times of conflict. Close to 1.5 million people have been internally displaced or have become refugees in neighboring countries after having fled DRC to escape the continued violence. Young people make up about 19 percent of the country’s population but account for 47 percent of deaths during this conflict. Poverty is rampant, according to UNICEF, and 72 percent of rural households and 59 percent of urban households are poor. Nearly 40 percent of children under 5 suffer from chronic malnutrition and most of the population lives with moderate to serious food insecurity. The 2015 Human Development Index ranked the DR Congo 176 out of 188 countries and territories listed.